ENIAtype is a transdisciplinary architectural practice specialising in unpacking the complexities of our environment through architecture. Eniatype is based in Central London established by Architect Dr. Shaun Murray in 2011. All works © ENIAtype 2012. Please do not reproduce without the expressed written consent of ENIAtype. In this issue, the contributors interrogate the link between practice and designing through the act of making as a direct presence of the qualities of the environment. Timothy Morton examines the inescapable paradoxes and contradictions inherent in living things, our place within nature and our attempts to understand the world through science. Yorgos Loizos outlines the way in which human encounters with everyday objects can be uncanny, presenting a series of design strategies that generate a spatial complexity informed by different environments, while Kjell Yngve Petersen's article discusses a compositional consideration from the performance director's point of view on how to stage listening ecologies. In other articles, Benedict Singleton offers a perspective on how an 'ecological' approach to architecture might reactivate links between 'design' as craft and 'design' as implied in being crafty, and offers some thoughts about cunning as the way ecology and design meet. Claudia Westermann explores the idea that the process of taking up a dialogue - through reading and writing - can be considered a question of design, addressing the notion of complexity through the conceptual lens of poiesis. Mathew Emmett uses a 1940s Air Raid bunker in Plymouth as a case study to interrogate the way in which architecture can elicit complex perceptual responses, exploring to what extent space acts as an active agent in triggering sensations of temporal dissonance. Finally, this issue includes a series of project profiles including examinations of the abandoned 'Mole Man Site' in London's Hackney; an experiment on the effects of altering the relationships between rabbits and the ecosystem of the sand dune network of Braunton Burrows; and a house for an automotive enthusiast under the Westway, West London. Following Design Ecologies 1.1’s inquiry into a field of ‘thinking in design’ we begin to unpack a weird – but great- set of similarities between points of view that are wildly different. As Benedict Singleton has described in an email to me: “ There is a constant doubt about ‘what do we do now that it doesn’t seem obvious what ‘practice’ even is’, but also a lot of ingenuity, invention. And in a slightly different register, they seemed to share a mix of vague horror - the lesson of ‘ecology’ was by no means taken to be some happy-clappy, ‘let’s all be sustainable’ one - and a strange sort of comedy. Felix Robbins and I were talking in the AA bar about how Samuel Beckett the general sentiment seemed to be - ‘try again, fail again, fail better’, or ‘must keep going, going on, call this going, call this on’. It’s like we’re all doing work that makes a certain kind of sense to us and to each other, and although we’re not really sure where it’s going, we’re doggedly journeying on through a surreal landscape. Hopefully, Design Ecologies will be a vehicle to traverse it.” This statement outlines a way in which we can encounter designing in the world as a system of strange communication that is complex and involving. 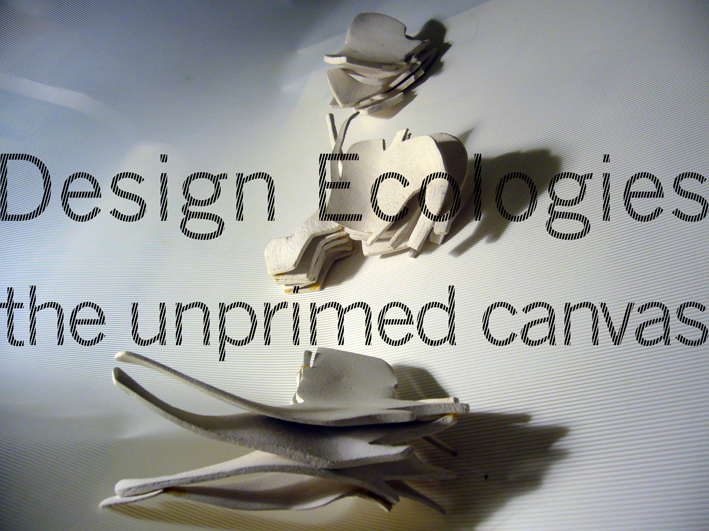 Design Ecologies 1.2: The Unprimed Canvas is related to Francis Bacon’s decision to use an unprimed canvas where every mark on the indelible surface is very important. This has everything to do with ecology as a complex system. Drawing forth the idea that design could be embedded within the environment, we can begin to think of ‘design before the design’. The canvas of our environment is not blank but it is indelible. It could be said that design does not need an active interfering designer, as it’s an inherent part of the universe. A more assertive designer could treat design as a giant simulation and just allow things to happen. There could be a series of variables of sequencing, prompting, editing – a situation of coherent play with itself. Every action in the sequencing of prompts could have a spatial consequence on other environments, a process of managing uncertainty through an invisible web of relationships – collapsing the artificial onto the natural. We are caught between acts of making and the experience of making - and involved within the doubt of both. Yet when considering a contemporary built environment the making of experience is often overlooked and ignored. As practices and production methods evolve so too should our description, understanding and development of our urban and rural landscape. Just as a digital economy is growing, lively cottage industries are equally booming creating a rapid response to an evolving spatial experience through material and visual means. The potential embedded within the mundane and the marvelous awaits extraction. Architecture is now being asked to be equally performative and sophisticated. Practice should have a positive feedback with environment through experience. The tension of an 'inhibited synthesis' provides the real condition for the irresolvable struggle of designing in relation to building. Codifying this relationship through a continuity of materiality. A synthesis relocated within unknown materiality. 'Matter' is no longer the name of a recognisable substance, but a cypher for the unknown, 'Materialism' is no longer a pretext for critique but a vector for exploration. The more we figure out how enmeshed we are in complex systems with affiliation, the more we become aware of some very strange entitles that seem to emerge from these systems. Similarly to what Martin Heidegger says about poetry and technology. The more of what he calls Earth emerges out of the world like an unprimed canvas glimpsed between globs of paint. It is within the context of the articles in this issue that we may rethink our concept of design and our awareness of ecologies.